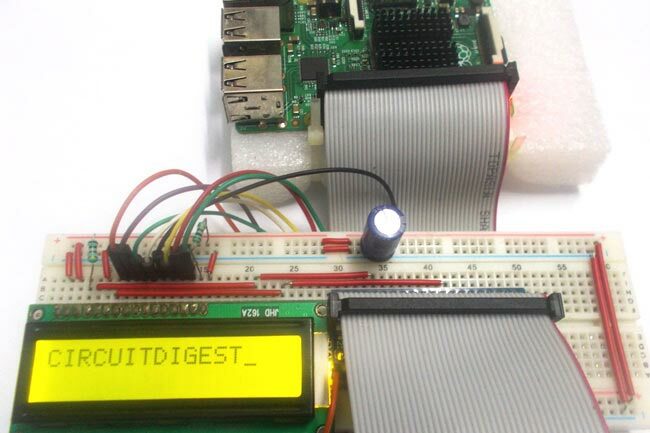 In this tutorial, we will Control a 16x2 LCD Display using Raspberry Pi. We will connect the LCD to GPIO (General Purpose Input Output) pins of PI to display characters on it. We will write a program in PYTHON to send the appropriate commands to the LCD through GPIO and display the needed characters on its screen. This screen will come in handy to display sensor values, interrupt status and also for displaying time. There are different types of LCDs in the market. Graphic LCD is more complex than 16x2 LCD. So here we are going for 16x2 LCD display, you can even use 16x1 LCD if you want. 16x2 LCD has 32 characters in total, 16 in 1st line and another 16 in 2nd line. JHD162 is 16x2 LCD Module characters LCD. We have already interfaced 16x2 LCD with 8051, AVR, Arduino etc. You can find all our 16x2 LCD related project by following this link. We will discuss a bit about PI GPIO before going any further. There are 40 GPIO output pins in Raspberry Pi 2. But out of 40, only 26 GPIO pins (GPIO2 to GPIO27) can be programmed. Some of these pins perform some special functions. With special GPIO put aside, we have 17 GPIO remaining. There are +5V (Pin 2 or 4) and +3.3V (Pin 1 or 17) power output pins on the board, these are for connecting other modules and sensors. We are going to power the 16*2 LCD through the +5V rail. We can send control signal of +3.3v to LCD but for working of LCD we need to power it by +5V. The LCD will not work with +3.3V. As shown in the Circuit Diagram, we have Interfaced Raspberry Pi with LCD display by connecting 10 GPIO pins of PI to the 16*2 LCD’s Control and Data Transfer Pins. We have used GPIO Pin 21, 20, 16, 12, 25, 24, 23, and 18 as a BYTE and created ‘PORT’ function to send data to LCD. Here GPIO 21 is LSB (Least Significant Bit) and GPIO18 is MSB (Most Significant Bit). Contrast Setting, connected to Vcc thorough a variable resistor. We strongly recommend to just go through this article to understand the LCD working with its Pins and Hex Commands. 2. Giving value 0x01 to data port as a command to clear screen. 4. Proving the ASCII code for characters need to be displayed. 6. Once this E pin goes low, the LCD process the received data and shows the corresponding result. So this pin is set to high before sending data and pulled down to ground after sending data. As said we are going to send the characters one after the other. The characters are given to LCD by ASCII codes (American standard Code for Information Interchange). The table of ASCII codes is shown below. For example, to show a character “@”, we need to send a hexadecimal code “40”. If we give value 0x73 to the LCD it will display “s”. Like this we are going to send the appropriate codes to the LCD to display the string “CIRCUITDIGEST”. We are setting 10 GPIO pins as output pins, for Data and Control pins of LCD. while 1: command is used as forever loop, with this command the statements inside this loop will be executed continuously. After writing the program and executing it, the Raspberry Pi sends characters to LCD one by one and the LCD displays the characters on the screen. IO.output(22,0) # pulling down EN pin to tell LCD we have sent the data.